Ah, the problems rich white women must endure as they float through life: too many men wanting them, too many places to see, too much food to eat...how DO THEY cope? What agony it must be to leave your high-paying job and travel to Italy, India, and Bali (all expenses paid) to 'find yourself'. I imagine any woman in say, Somalia or Afghanistan does exactly what Elizabeth Gilbert did in Eat Pray Love all the time: travel the world, find new lovers everywhere, and find that to have peace, they must have balance, and a man. After all, women around the world are interested in only one thing and one thing only: men (Gloria Steinem be damned). Eat Pray Love (no commas, which is the antithesis of going comma crazy and incorrect) is based on the best-selling book by Miss Gilbert, so I'm figuring that it is her journey, as shallow and narcissistic as any coming from a woman of high privilege. Elizabeth (Julia Roberts) is unhappy: her husband Stephen (Billy Crudup) is far too attached to her, worshiping the ground she walks one but with the flaw of forever floating from one dream to another. Stephen is forever wandering through life, like a child excited about finding a new toy: he dreams of doing this, of being that, which granted would drive anyone a bit batty. However, Elizabeth is not happy (and that, damn it, is the important thing, that she be happy). She dumps a devastated Stephen and then goes on to have a romance with actor David (James Franco), who introduces Liz to the glories of Eastern mysticism (Hinduism, I believe). He too dreams, of attending their guru's ashram in India. Liz finds that, like with Stephen, she is turning into a copy of her latest lover. With that, she virtually breaks it off with David and decides the thing to do is to go around the world to find out who she is. Her plans are to go to three places: Eat Pray Love, also known as Italy, India, and Bali. (If she had opted for Indonesia, she could have had Three Eyes, but since Indonesia is a predominantly Muslim country, the idea of a woman finding love with the perfect stranger I figure wouldn't be looked on kindly). In Italy she learns to enjoy the sensual pleasures of food. In India, she at last goes to the ashram, but wouldn't you know it: the guru has gone to New York. How selfish of the Guru: didn't she know Elizabeth Gilbert was coming? At said ashram, she meets Richard from Texas (Richard Jenkins), a man who by Liz's own admission uses 'bumper sticker' phrases to describe everything, including Liz, whom he has nicknamed "Groceries" for her lavish eating. 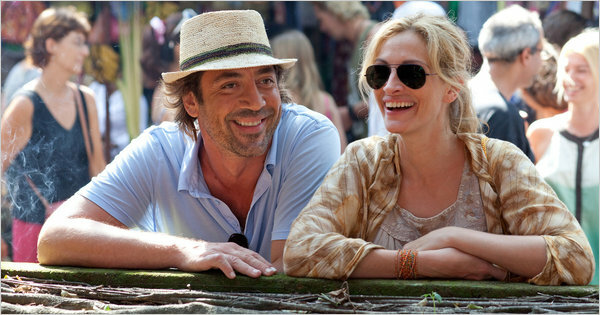 Having found inner peace, she goes to Bali to reconnect to a wise old Balinese, and in Bali she meets Felipe (Javier Bardem), the hunky Brazilian who quickly falls in love with her. Let me start off by asking, why is it that whenever people go for spiritual journeys, they always head out East? Why do Westerners always turn to Buddhism and Hinduism for spiritual fulfillment? It be nice to see a film or read a book where someone found peace and spiritual fulfillment in Judaism, Christianity, or Islam. Nothing against those who practice Buddhism or Hinduism or even Shintoism: they are free to practice any faith they wish. However, the idea that the East holds the answers to our Great Questions is wearing a bit thin. Be that as it may, Eat Pray Love suffers from this almost deranged self-absorption on the part of Gilbert. This may not be the first film that celebrates this sense that it truly is "all about her", but it is the first one that celebrates this narcissistic discovery as being revolutionary and almost demand that we celebrate it with her. In all her journey from New York to Bali, we just see some beautiful locations but we can never get away from the idea that this woman is so hopelessly self-centered that she is oblivious to anything outside herself. She doesn't seem particularly interested in the lives of others, from Stephen and David to Richard from Texas or Felipe apart from how they affect her. Each man she sleeps with is passionately devoted to her, each person she meets is passionately devoted to helping her and meeting her needs. I did find it curious that throughout Eat Pray Love she never appears to do anything for anyone else. With that in mind, it becomes harder and harder for us to want Liz to succeed in her efforts to find herself and inner peace. Instead, we begin to marvel at how one person could be so wrapped up in herself that she thinks her journey of self (centered)-discovery could have taken her halfway around the world only to find that the person Elizabeth Gilbert truly loves is Elizabeth Gilbert. Julia Roberts is still luminous, and writer/director Ryan Murphy, he of Glee fame or infamy (depending on your point of view) lights her smile in simply gorgeous light. However, she can't get beyond looking beautiful and making Liz into anything than a navel-gazing individual who is astounded that the cosmos would take the time to pull off the joke of sending the guru from India to New York when she came from New York to India to find said guru. All her various courtiers (Crudup, Franco, and Bardem) did their best in filling in the required tasks of their characters: showing how every one of them was madly in love with her but were with the last one not good enough for her. I figure Jenkins was suppose to be aggravating as Richard from Texas, who gives her a great many platitudes but no insight into how she really doesn't have it bad (as opposed to him, who does at least have something to mourn). 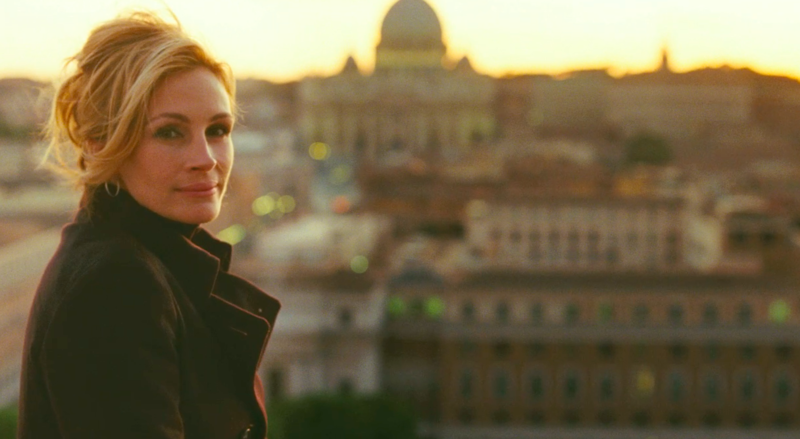 I can't say everything about Eat Pray Love was lousy: the three countries look beautiful and the film does serve as an advertisement to travel the world. Therefore, Robert Richardson deserves credit for making Italy even more beautiful, India chaotic and beautiful, and Bali lush and beautiful. HOWEVER, Eat Pray Love has that damn voice-over deal that nine times out of ten ruins the movie (the tenth being such films as Sunset Boulevard or Blade Runner, where it works). Still, Eat Pray Love can never get away from being a journey to the center of attention. The ending of the film undercuts the entire message it was trying to make: we see Stephen and David pretty happy in their lives post-Liz (which must have been a miracle on the level of Fatima given that Elizabeth Gilbert rejected them) but neither of them made this wildly introspective journey. They somehow managed to find peace and joy without Eating Praying Loving, or at least without going on about it. Somehow, I think all of us would be able to do the same. By the end of Eat Pray Love, you'd be inhuman if you didn't want to go up to Elizabeth Gilbert, shake her and say, "Get Over Yourself!"